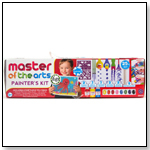 The Master of the Arts brand focuses on fine motor skills, color theory, sensory play and art education. This set includes everything a child needs to create his or her own fine arts painting in one easy to store and easy to carry box! This kit includes a watercolor paint strip, 3 paint brushes, 2 wacky brushes, 2 stencils, 2 sponge rollers, 3 tempera paints, a 25 ft. blank coloring roll and easy-to-follow instructions, as well as tips and tricks for color mixing on the package! 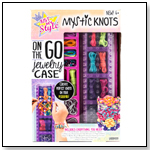 Make gorgeous bracelets with intricate knots anywhere, anytime with the Just My Style Mystic Knots On-the-Go Jewelry Case! Carry everything you need in this convenient carry case and use the peg board on top to master perfect knot making! This kit includes an on the go bracelet jewelry case, a bracelet peg board, 2 embroidery thread skeins, 10 pegs, 5 e-hook clips, 50 metallic accent beads, 5 satin cord skeins, 5 paracords and easy-to-follow instructions. 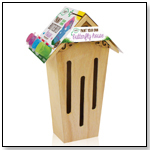 Provide an adorable, vibrant shelter for the butterflies in your garden with the Creative Roots Butterfly House! Add some whimsy to the front porch or your garden and attract gorgeous butterflies at the same time. 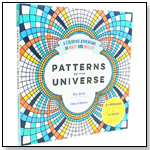 For children and adults alike, this is a hit for any garden lover! This kit includes a wooden butterfly hours, 4 paint pots and a paint brush. 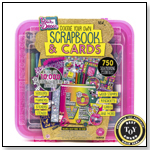 Create a beautiful handmade scrapbook to catalog all of your fondest memories with the Your Décor Scrapbook & Cards kit! The trendy patterned scrapbook paper and fun, vibrant stickers are sure to appeal to any tween. Create separate pages to put together into a book or fill the included blank book with pages of memories. This kit includes a convenient storage case, a 30 page scrapbook, 5 cards and envelopes, a glue stick, a stencil, sticker sheets, punch-outs, gemstones, a CD rom with over 10,000 digital scrapbooking accessories, printed pages, wooden stamps, craft scissors, designer markers and easy-to-follow instructions! Illuminate your child’s knowledge by combining simple chemistry with glowing power. 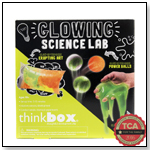 Let them create their own glow-in-the-dark toys and science experiments from molding bouncing balls to watching the pressure build in erupting colors! Explore the basics of chemical compounds and reactions with this hands-on Glowing Science Lab! This kit includes a ball mold, glow-in-the-dark power ball crystals, zinc sulfate, baking soda, citric acid, guar gum, sodium tetra borate, resealable bags, glow-in-the-dark paint, a mixing stick and a fun poster with instructions! 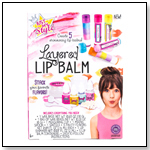 The Just My Style Lip Balm Lab is perfect for the aspiring makeup artist! Create 5 shimmering lip balms in 3 different flavors. Stack the different flavors within one lip balm or use the different flavors to create layered colors. This kit includes a wax base, a bag of wax beads, a measuring cup, mixing spoon. 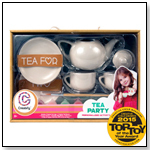 Personalize your very own tea set with the Creatify Tea Party kit! Inspire creativity and imaginary play with this fun, all-inclusive ceramic set. From afternoon tea parties with imaginary friends and stuffed animals, to displaying this beautiful ceramic set on the shelf as a keepsake, the Creatify Tea Party personalized activity kit is sure to bring tons of smiles and memories! This kit includes 2 ceramic tea cups, 2 ceramic tea saucers, a ceramic teapot, a paintable cling sheet, a paint brush and 6 ceramic paint pots. Build, paint and decorate an awesome monster truck with real moving wheels! 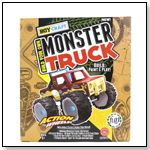 The Boy Craft Monster Truck offers the perfect mix of creativity and open ended play, to make it a great value. Winner of the Parent’s Choice Fun Stuff Award, it’s clear to see why parent’s love this kit! This kit includes a wooden monster truck (40 pieces), 4 plastic wheels, 10 paint pots, glue, a paint brush, a sticker sheet and easy-to-follow instructions. 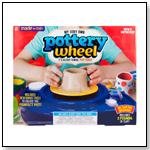 Making pottery at home has never been easier with the “My Very Own Pottery Wheel” from Made By Me! Create the perfect pot with the bonus tool or mold your own bowls, jewelry plates, vases and more! With 2 pounds of air dry clay, you can make a number of different projects! This kit includes a motorized potty wheel (requires D batteries, not included), an adjustable tool arm, a foot pedal, 2 pounds of clay, 3 pottery making tools, 2 clay tools, a paint brush, a sponge, a ceramic paint strip, a cutting cord and easy to follow instructions. Make better bracelets faster with the new Just My Style™ Paracord Loom! Create 8 trendy bracelets from authentic paracord. 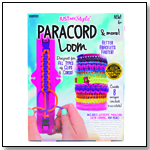 The Paracord Loom is designed for all kinds of clips & cords. This kit includes 1 Paracord Loom, 3 8 ft. paracord skeins, 4 8 in. paracord skeins, 3 2 ft. paracord skeins, 3 skeins wax beading string, 3 friendship thread skeins, 1 colorful ball chain, 5 e-hook clips, 8 buckles, tape, fabric glue and easy-to-follow instructions!